and wish all who bought bulls a resounding success with their purchases. Sired by L1 Achiever 91151H. Good luck to Ian and Sian Houston with their “Ervie” herd sire for their new “Culbae” Hereford herd! 48 bulls were presented with 100% ring clearance to average £2303. Read a full report of the sale here. Think Ervie Line One’s to improve yearling growth. Think Ervie Line One’s to improve calving ease. Think Ervie Line One’s to improve hybrid vigour. Think Ervie Line One’s to improve calf uniformity. Think Ervie Line One’s to improve milk. Think Ervie Line One’s to improve homebred replacements. Think Ervie Line One’s to improve udders & teats. Think Ervie Line One’s to improve feed efficiency. Think Ervie Line One’s to improve fertility. Think Ervie Line One’s to improve breeding soundness. Think Ervie Line One’s to improve temperament. Click here for details of local accommodation. Keep cows to work for you, not the other way round! ....................grow into high performance cows like this. NATURALLY DEVELOPED BULLS- the very best from our 165 Cow Herd. PEDIGREE HEREFORD REPLACEMENT FEMALES- bred for sound feet and legs, good milkers, good udder and teat placement, easy-doing, docile and problem free. COMMERCIAL 'BLACK BALDIE' HEIFERS by top maternal A.A. sires. EBV's ON ALL OUR CATTLE. SCANNED AND WEIGHT RECORDED. FARM ASSURED. REALISTIC PRICES, SELLING SINGLES OR BATCHES ON FARM . 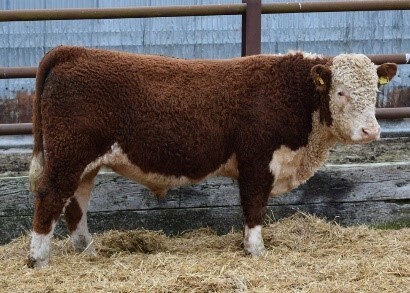 Ervie Herefords are one of the leading UK Hereford Cattle Breeders. 48 Hereford bulls grossed £110,500. Price range : £1800 - £7000. Average £2302. 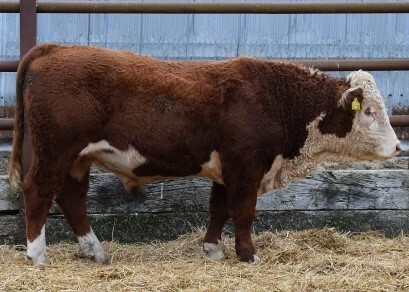 for the annual Ervie Herefords Spring Bull Sale held by the Douglas family. Following a “mince & tatties” lunch at noon, auctioneer Harry Begg got swiftly into his stride with first bull in the ring, Ervie L1 Achiever 172218 making £3000 and selling to Ardlamont Estate, Argyll for pedigree use. This dark, attractive bull with a 38kg birthweight, has a straight Line One pedigree and descends from one of the first embryo flushes imported to Ervie in 2005. 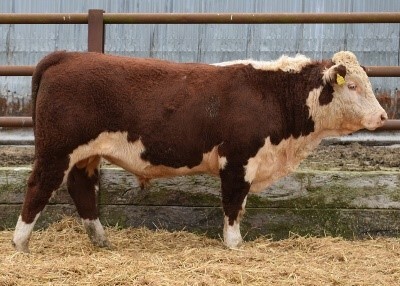 Fifth lot in the ring, Ervie Advance 172314 was the bull many had marked to buy, with the top weights at both 200 and 400 days, sired by Ervie L1 Achiever 91151H and from Libby family, he sold at £5200 to E Lewis, Salbri Herefords in Anglesey, for pedigree use. Well-marked and dark-coloured, with great natural thickness and power, he is full brother to herd sire at Hyde Herefords, nr Worcester. Seventh lot through, Ervie Advance 172213 made the highest price of the day, when he sold at £7000 to new pedigree breeders, Ian & Sian Houston, Newton Stewart. This big, lengthy bull sported a really well-balanced set of figures including a Terminal Index of +33 and Maternal Index of +43 and is sired by Ervie L1 Achiever 91151H and from a top cow from the Tribute family. Two lots later, commercial breeders Messrs Hutton from Castle Douglas, went to £4500 for yet another “1151” son and this time from the Gypsy family. Dark-coloured and stylish, this bull boasted a great set of figures combining calving ease and growth and with a Terminal Index of +34 and Maternal Index of +42. Coming through 4 lots later, Ervie Advance 172216 sold to repeat buyer Iain Wilkinson, Dundee at £3400 for both pedigree and commercial use. 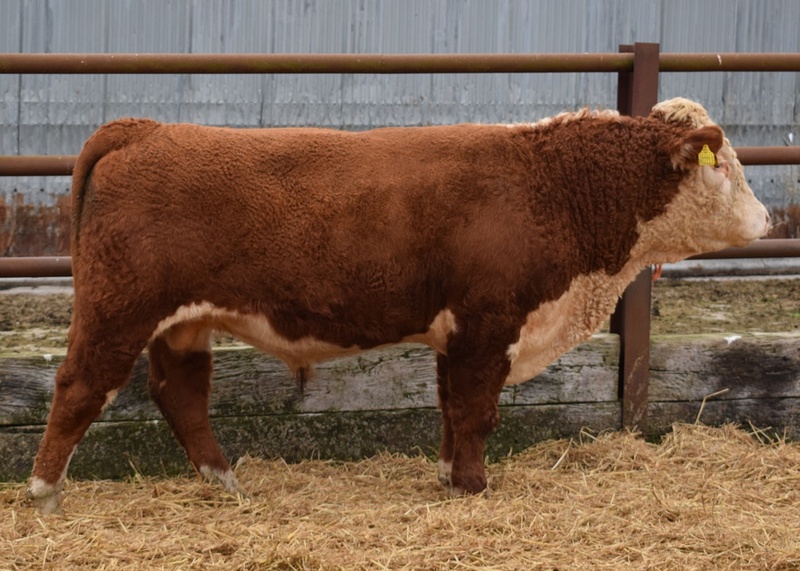 Sired by Ervie L1 Achiever 131636 and from the Peach family, with a birth weight of 38kg and one of the largest and heaviest bulls in the sale, he goes to work mainly on daughters of Ervie Advance 141836 bought for £7200 in the 2016 sale. Another two lots later saw repeat buyer Mark Ogg, from Montrose go to £3000 for Ervie Advance 172234. An upstanding, correct bull with thick top and loin, he is sired by Ervie L1 Achiever141753 and from a Tribute cow, he goes to work alongside two previous Ervie purchases on a large, predominately Simmental commercial beef unit in Angus. New customers, R G Elliot and Son travelled up from Northampton to purchase two bulls including Ervie Advance 172231 at £2700. 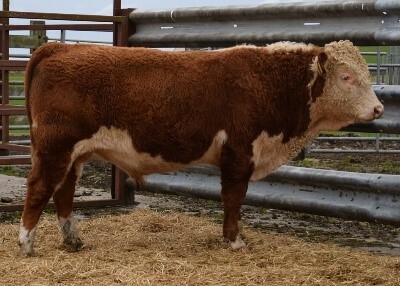 This quality son of Ervie L1 Achiever 141780 is from the Crocus family is joined by Ervie Advance 172311 to go onto Saler x Shorthorn type females. Please contact us if you have any questions or concerns pertaining to these sale terms and conditions. All sales are cash and in pounds sterling. The auction will be conducted by Harry Begg (Tel. 0771 356 9593) from Dumfries Mart and payment to be made to him at close of sale unless by prior agreement. Bulls being left at Mains of Airies require 25% paid on sale day and the remainder cleared with the auctioneer one week before uplift. Bulls can be picked up any time after payment has been made. All transportation expenses to be the responsibility of the buyer. Local livestock transporters, A Jamieson & Sons will be in attendance at the sale and will be happy to assist with bull deliveries both north and south. Contact George (07850368533), Ian (07889218280), Andrew (07702465074). We will endeavour to assist with transport to a convenient meeting point within the UK mainland. Bulls sold to Northern Ireland will be isolated and tested at the consignors expense, but must be uplifted directly at the farm at the buyers expense. Bulls can stay at Mains of Airies up to the end of April and will be cared for by us but at the buyer's risk. Any death or injury after the animal is sold is at the buyer's risk. Insurance is advised. Anyone attending the farm to view the stock does so at their own risk. We reserve the right to withdraw any animal from the sale. Latest routine four-yearly clear Tuberculosis Test completed 12th January 2018. The entire adult herd is Johnes tested along with the TB test every 4 years as cost-effective surveillance to ensure there is no Johnes development within the herd. The herd is BVD accredited. The breeding herd has been on a strict Lepto & BVD vaccination programme since 2001, with IBR vaccination also since 2017. 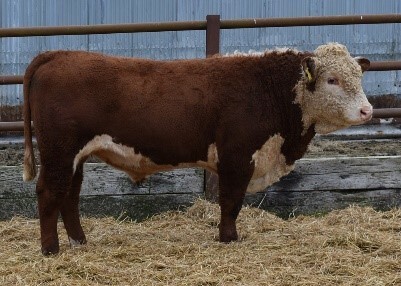 All the sale bulls require their booster vaccines by end of May. Our customers value our robust disease biosecurity, the high health status and remoteness of our closed herd. The bulls were all treated with Zanil drench for fluke 30/01/19. 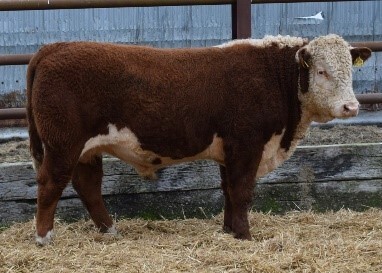 All bulls sold are warranted stock getters, fertile and capable of natural service. Any claim of bull infertility must be made after 1 month from the date of the sale and within 9 months from the date of the sale and must be backed by a written statement from a practising veterinary surgeon confirming the bull to be infertile. The vet must confirm that the infertility is not due to either injury of infection after the sale. Bulls proving to be infertile shall either be replaced to the satisfaction of the buyer or refunded the entire purchase price.